We love our dogs!!! These Goldens are the best. Rosie on High Alert in our woods. Romping in the Living Room. Click on the orange link below to visit a blog from one of our satisfied referrals. Check out this link from one of our satisfied customers. The ORANGE link above. We are receiving deposits for upcoming puppies that hopefully will be born near June 7th 2019. 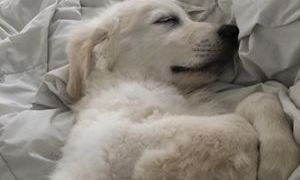 Our goal has always been to place happy healthy puppies in great homes. We offer a 2 year guarantee and our service is for the lifetime of your new best friend. 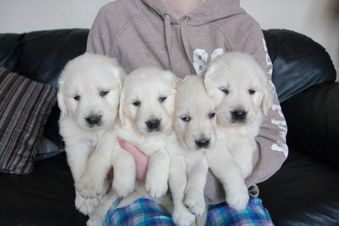 Last year we were looking for a golden retriever online and found the Baileys. When we arrived for our first visit we were not disappointed! The set up they have is very professional. When they took us to see the puppies we fell in love immediately! The hardest part was making the decision! All of the puppies were absolutely beautiful and perfect. We finally did decide on a little boy. Best decision we’ve ever made! We brought him home on the next visit and my son and his wife came to meet him, they were smitten immediately! We knew that Terry still had a little girl available so we went back and bought her for them. We have just fallen in love with Terry and Julie as well. You won’t find better breeders that love their dogs! 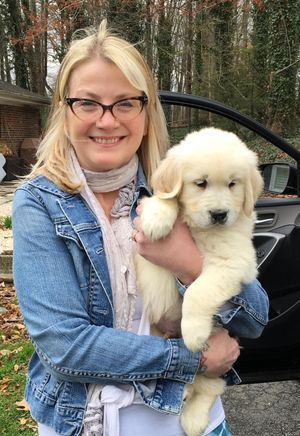 If you’re looking for a English Golden, this is the place. you should consider for your next event. 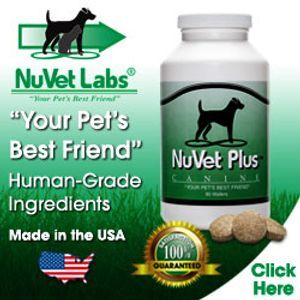 Our Dogs now use NuVet K9 Waffers. Click on the link below to place your order for this amazing product that can help keep your puppy and older dogs healthy. RECEIVED THIS FROM ONE OF OUR HAPPY OWNERS...THANKS SO MUCH. WE LOVE PUTTING HEALTHY HAPPY PUPPIES IN GREAT HOMES....Mr Bailey... Have been meaning to contact you .... I can not even begin to express what a beautiful dog Murphy (aka mr sky blue) is.... He not only is a beautiful on the outside - he is the sweetest animal... fun, adaptable, personality plus, loving and very trainable. I don't know what we did without him! We had been displaced due to a mold situation in our home- therefore wherever I went, Murphy went. He caught the attention of countless people everyday and they always asked to say hi and pet him. I share your website with all the golden lovers. He is a walking advertisement lol. I am so very thankful we found your site. He was perfect from day 1- no worms.. no diarrhea.. no vomiting ... Healthy and happy. I will gladly give a referral anytime you may want one... Couldn't be happier w overall experience. Thank you so very much! We love him so very much! And didn't know how much we needed him till we had him- he lights up everything! Sincerely, many, many thanks!! Since we live with these dogs, and are with the puppies from birth to going to your home, we want you to know that we are involved in helping you pick the best puppy for your needs. We will find out, as we talk with you, what would be a good fit for your needs. No one knows the temperament of the Dam and Sire and the puppies better than us. 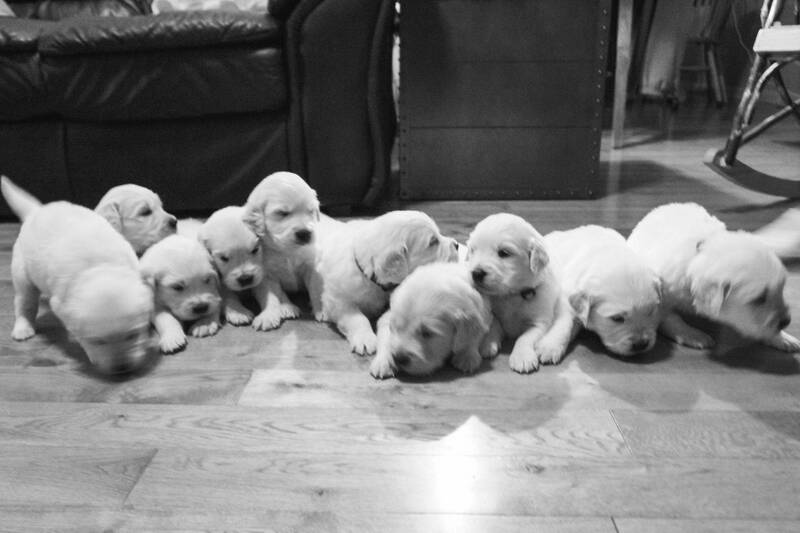 Therefore, as the breeder, we reserve the right to have the final decision as to which puppy is best for you. is being pulled behind skiing. HA! HA! 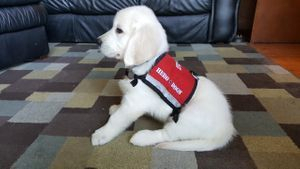 We have dogs now who are diabetic alert service dogs, and service dogs to assist folks and dogs who help with therapy. 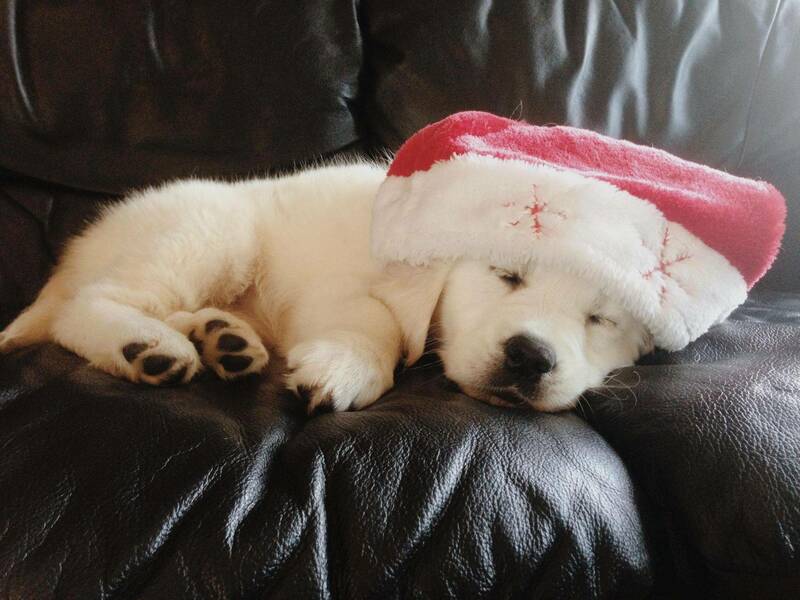 Golden Retrievers are the BEST. who love and care for these dogs as family. This is Cabela at our recent Puppy Fun Day. She is with one of our trusted Guardian families. 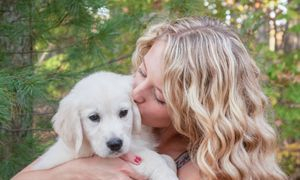 This is a program we love that puts our dogs in great homes and allows us to get wonderful puppies too. She has passed all her health clearances and soon will enter our program to bring you more wonderful puppies. Talking about SMART. Does High Fives and goes to get in the tub for a bath if you mention a bath. One of the smartest dogs we have seen. Have you ever seen anything more Adorable? 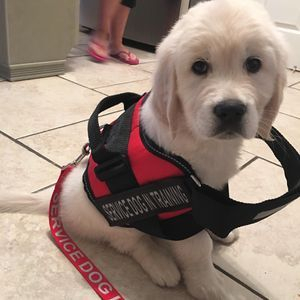 This handsome male went to his new home in September 2016 and will be trained as a diabetic alert service dog. The training is extensive and the new owner will be investing a considerable sum. 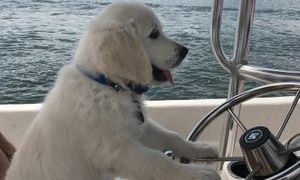 We at Cold Spring Mountain Retrievers are so happy for this new puppy and his adventurous life ahead. NEWSFLASH: We were contacted by the Jimmy Fallon show to use our puppies on his show but our puppies were too young. Maybe next time. 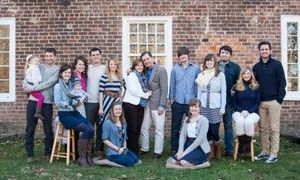 Our Daughter and Son in law, who are professional photographers, have taken pictures for us for our website. You can find their business on facebook by searching for Light and Letter or email them at: rodgers.breanne@gmail.com. These dogs make the best of the best dogs for pets, great friends, and hunting dogs. Our dogs come from outstanding bloodlines like Dewmist, Ashbury, and Erinderry. 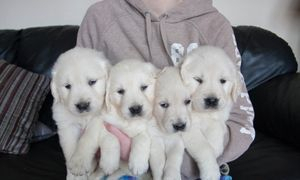 Of course these are English Golden retrievers from European decent. Folks who see these dogs for the first time have a hard time NOT staring at them. 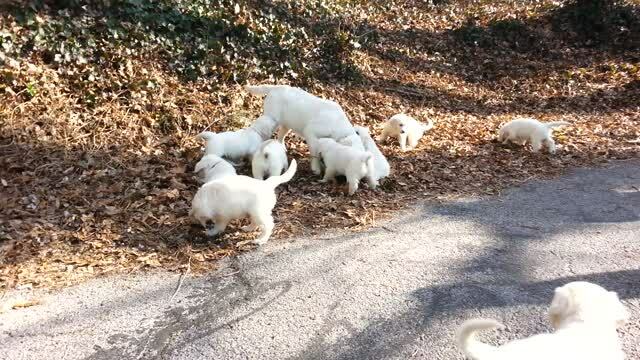 Their beautiful almost white coats and the dark black eyes and nose that stand out make them a real attraction. Champions in our bloodlines means outstanding quality...this is our goal and commitment to you. We love equipping our puppies for whatever they may experience in your home. They're loving, attentive friends but also amazing athletes. 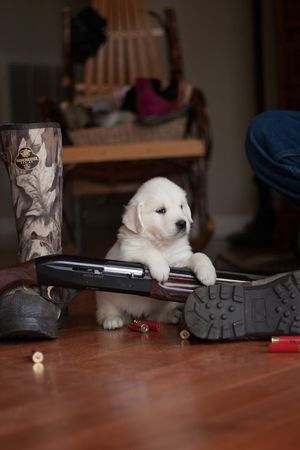 Squeaking toys, old shoes, shotguns, shells and ducks are all incorporated in their day-to-day helping to make them the most versatile companions we can offer. 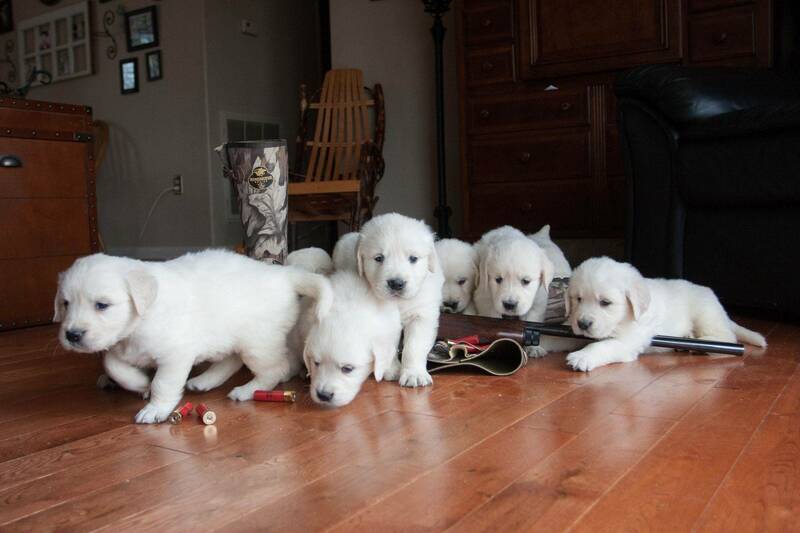 Get one as a beautiful addition to your family or your newest little hunting buddy. We can't wait to see what these beauties become for you! Kai is in the hands of his new owner...Piper. He is from the current litter born Feb 1st 2016.
he will have a great life. We love taking our dogs on hikes. 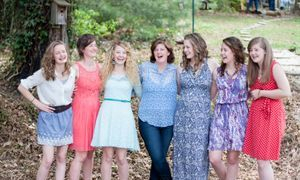 Julie and I have been blest with 6 lovely daughter and two sons. She is in the middle just as pretty as all the girls. YEAH. We love our dog family and appreciate the loyalty these dogs have to us. Are you sure you want just one? 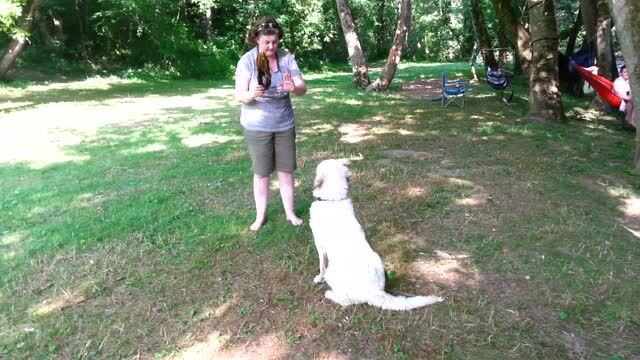 We have had families get 2 and Golden Retrievers are great to get along with other pets and one another.